Dear quests, would like to thank you for your preference to spend your holidays at our hotel as and for your support ranking us with your comments as the first hotel in Lesvos for second consecutive year. 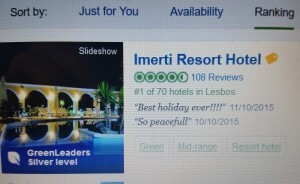 The management and the staff of IMERTI BOUTIQUE HOTEL, promise you to continue the effort to satisfy the customers by increasing the quality and the variety of supplied services, so as to fully responds and with the best possible way to the guests desires making their journey and their vacation to strong moments of emotion, relaxation and happiness. To this effort we have already certified with ISO of supllied services, envirommental administration of the hotel and also certification as “Green Hotel” with the GREEN KEY and our distinction as GREEN LEADERS of TRIPADVISOR, ranking our hotel as the unique eco friendly hotel in Lesvos. Furthermore taking into consideration the continuously variable needs of our guests, which we would like always to be in position to satisfy, one of the following days a questionaire will take place, where you can reccomend us changes and ideas which will cover your desires. Wishing to thank you indeed for your support, we offer you a special discount of 30% for your next stay to our hotel. This offer vallid for all room types and for stays at period 01/04/16 till 15/10/16. Concers booking until 05 Jan 2016. To be valid this special offer must be prepaid 50% of the total amount. This special offer can not be conbined with any other offer.